Outside my Window…We have blue skies today, after a very rainy, grey week. There is a gentle breeze trembling the few remaining leaves on the tree. Our grass is lushly green, which is typical for our moist, temperate climate. No excuses! I must get outside for a leisurely walk today. I am thinking…of the menu for dinner tonight. We are having some friends from church, and some of the children’s best friends over for a Sloppy Joe dinner and game night this evening. As well as Sloppy Joes, I think I’ll serve cole slaw, an apple dessert (apple crisp, probably) with vanilla ice cream, and tortilla chips with Cowboy Caviar. I’ll include the Cowboy Caviar recipe a little further down on this post. From the learning rooms…Our daughter who is a high school senior is writing a paper about landscaping with native plants. She and I plan to go to a local nursery, Cloud Mountain Farm, to observe and take pictures of their ‘zero impact garden’ which is totally done with plants native to our area. I am thankful for…the faithful preaching of God’s Word, and a church ‘home’ of which we a glad to be members. Mix in bowl and salt to taste. 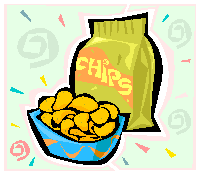 Serve with tortilla scoops or corn chips. I am wearing…Tie-dyed blue T-shirt with red knitted hoodie, denim skirt, and black leggings. I’m cozy and comfy on this breezy autumn day! I am reading…Aunt Dimity Takes a Holiday by Nancy Atherton. This is a fun, fantastical sort of mystery, not too scary, because I just can’t take that. I am hoping…to be ready for company by 4pm. There’s lots of laundry to do, and some paperwork, too, but it will all work out. I am creating…a hospitable home, with the help of all the family. It’s easier to feel free and easy about having folks over when the house is neat and clean (At least, that’s how it is for me!). My husband and son have the outside of the house and yard looking good; the girls and I have time to get the inside ‘spiffy-fied’, too. I am hearing…grandson Diederick playing the ‘drums’ on a container, and singing along. Around the house…My husband and I are working together quietly in his office. Well, he’s actually working while I do this blog post. Our youngest son is visiting with our married daughter in the dining room, while Deeder plays the drums. Another daughter is making a late pancake breakfast for herself and her younger sister. One of my favorite things…is a relaxing, quiet morning at home. A Few Plans For The Rest Of The Week…Wednesday is going to be quite the busy day. Our high school daughters have their ‘end-of-season’ soccer banquet, we have family night at church (which for me means bringing 30 potatoes, baked), and there is a care meeting for my elderly mom at her assisted living home. 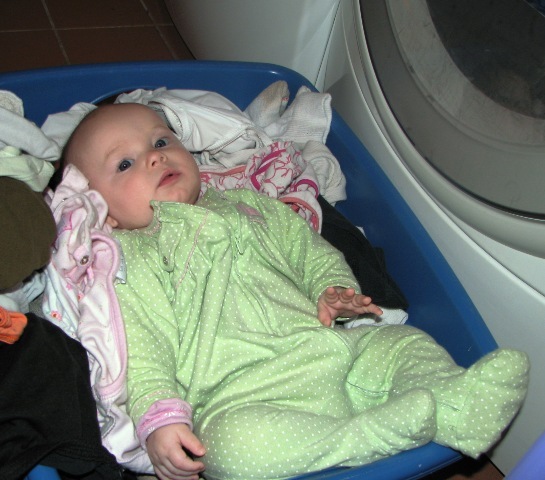 This is granddaughter Carly resting in the basket of clean clothes while her mommy does laundry. I used to do the same thing with my babies. It’s fun to watch Mommy work! Just one more picture. 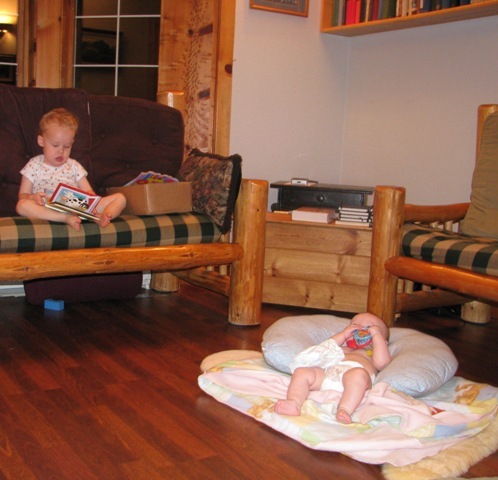 This pic is of grandson Diederick and granddaughter Carly relaxing in our very warm, woodstove-heated living room.